Aromatherapy Without All the Fuss! Now, Secure Online Ordering and Class Registration! Over 50% of chronic illness is caused by or aggravated by stress? Flow Masters LLC provides an answer to reduce stress and enhance quality of life, one person at a time! We offer innovative bodywork and premium aromatherapy blends handcrafted into high quality candles. Available in our imported Italian glass line with cork, 370 ml (approx. 12.5 oz.). Also available is our original line poured in Mason-type jars (since 1994). 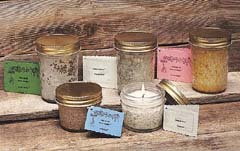 This homestyle country packaging is simple, down-to-earth and provides high quality, low cost, ecologically friendly candles. "Aromatherapy" is the modern word for the age-old use of scents to affect moods and assist life-enhancing processes. The aromas used have a subtle yet profound effect below the conscious level. The blends used in Herb and Oil Aroma CandlesTM are chosen for a pleasant scent and more importantly, each oil was selected for its effectiveness. Flow Masters' Herb and Oil Aroma CandlesTM are a high quality "aromatherapy" product in a safe, fun, easy-to-use form. All true aromatherapy products are made from high quality ingredients. The scents in Herb and Oil Aroma CandlesTM are derived only from high quality essential oils. We use no synthetic fragrances to make the scents stronger. The oils used are blends to reduce the chance of developing allergies or toxic reactions, which is always a possibility for sensitive individuals. In addition, the safest way to use aromatherapy is to diffuse the essential oils into the air in the room or space. This again reduces any chance of irritation or reaction. By far, the easiest and safest way to do this is never to handle the oils directly. Undiluted essential oils are generally irritating, if not hazardous. Flow Masters' Herb and Oil Aroma CandlesTM are specifically formulated of high quality herbs and pure essential oils. We use no synthetic dyes, fragrances or metal cored wicking. This long burning candle (usually up to 40 hours, 8 oz. size) is poured of the highest food grade paraffin in sealable, reusable containers to retain the volatile essential oils through storage and its burning life. assure you can get just the candle you are looking for! For a bit of history and other information on aromatherapy, click here! Index - other services/products available through Flow Masters!